Take your sound with you anytime, anywhere! While laptops, smartphones, and tablets are usually great when it comes to their graphics, their audio usually leaves much to be desired. Tiny, tinny speakers, do not make for a good listening experience. Want better sound without sacrificing mobility? Get bluetooth speakers! 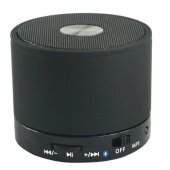 Bluetooth speakers come at a variety of sizes, from pocket sized, to full sound systems. Most are rechargeable and wireless, adding to their portability. Some even have rugged and waterproof features. Because they use bluetooth, you can connect any device to it regardless of their OS, whether it's a laptop, smartphone, or tablet, making it super flexible for users. Get a bluetooth speaker and start jamming today!